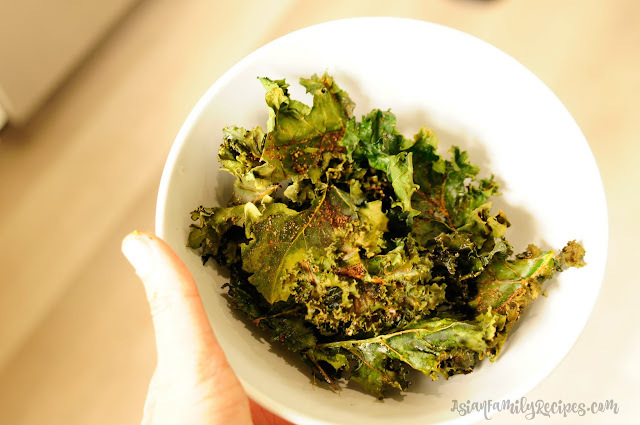 I made Kale Chips before but it turned out soggy and not as good as I expected to be. Months after, a friend came for a visit and she told me that she has been making kale chips often so I decided to gave Kale Chips another try this time following her direction. Place the kale in a large mixing bowl then stir in with the rest of the ingredients (salt, pepper, garlic powder, paprika, olive oil). Cook in the preheated 300 degree Fahrenheit oven for 15 minutes, rotate the pan, then bake again for another 10 minutes or until the kale shrank and crisp. It's ready to be enjoy. My kids finally can and love to eat kale. Woohoo! Rinse and let it dry thoroughly on a kitchen/ paper towel until both sides no longer wet. Place the kale in a large mixing bowl then stir in with the rest of the ingredients. Cook it in the 300 F oven for 15 minutes, rotate the pan, then bake again for another 10 minutes or until the kale shrank and crisp.